We are using White oyster mushroom (Pleurotus ostreatus). Both the Latin and common names refer to the shape of the fruiting body. The Latin pleurotus (sideways) refers to the sideways growth of the stem with respect to the cap, while the Latin ostreatus (and the English common name, oyster) refers to the shape of the cap which resembles the bivalve of the same name. Many also believe that the name is fitting due to a flavor resemblance to oysters. Alex, who is with us now for over 3 months with his project of growing mushrooms. They just came out beautiful. Thanks Alex! Mushrooms have always been the cookery delight of Asian countries, especially China. Among the numerous mushrooms utilized in China, oyster mushrooms have got a particular place on the dinner table, because of their higher nutrition content. The oyster mushrooms are frequently sliced as well as sauteed in olive oil along with garlic, that makes an excellent side dish or even snack. The mushroom is low in Sodium and very low in Saturated Fat and Cholesterol. It is also a good source of Protein, Thiamine, Vitamin B6, Folate, Iron, Magnesium, Zinc and Manganese, and a very good source of Dietary Fiber, Riboflavin, Niacin, Pantothenic Acid, Phosphorus, Potassium and Copper. At Jiwa Damai we produce useful research and we share it with the community. The following article is meant as a support for those who wish to learn about cacao, the black pod disease and methods how to deal with it. 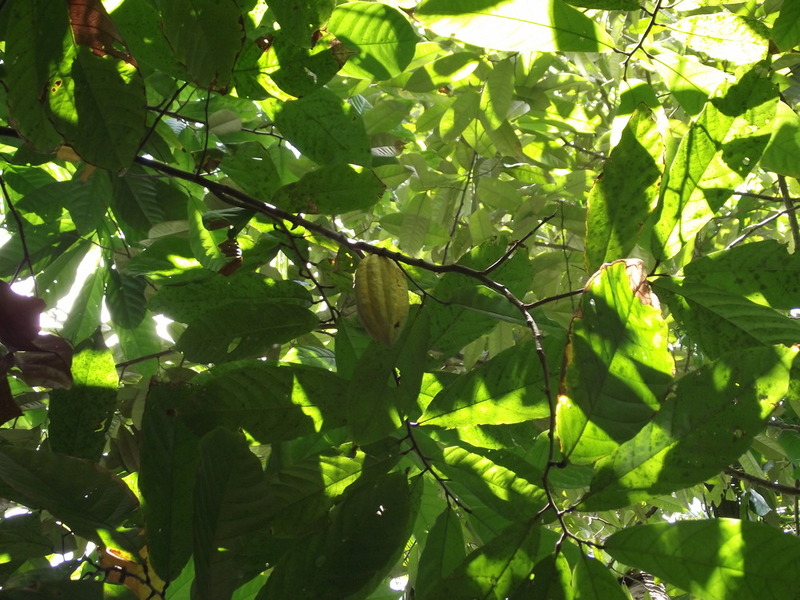 This article contains a short overview to thehistory and the ecology of the cacao, a summary of the cacao plantation in Jiwa Damai and a description of the black pod disease. The article was the work of our volunteer, Cedric Ricci, under the supervision of Dr. Margret Rueffler. 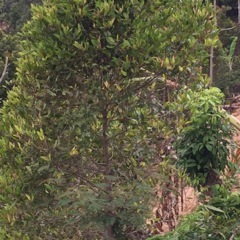 Jiwa Damai is located in a tropical forest with many cacao trees. However the cacao production has decreased in the past years due to a black pod infection. Margret Rueffler, our founder and caretaker of Jiwa Damai agro-permaculture and retreat center and the Lagu Damai Bali Foundation, discovered the art of permaculture 9 years ago. A transpersonal psychologist and therapist as well as an acupuncturist, it seemed a very organic move to expand from learning to love one’s Self, to uncover the deep love for the earth as a living being. Finding like minded who share and wish to deepen the inner knowledge in combination with a healthier style of living, the food becoming again true nutrition, a gift from the earth in its natural abundance. Letting the earth and nature experience our deep love by treating them with respect and care. If you wish to know more about the work of Dr. Margret Rueffler, please see Lagu Damai Foundation projects and her website www.pppi.net. The Linus Pauling Institute indicates that flavonoid antioxidants such as those found in cacao might interfere with the development of cancer. In one laboratory study published in 2002 in "Cancer Letters," anthocyanidins from cacao reduced the incidence of chemically induced pancreatic and breast cancer in laboratory animals. In a review of evidence from human subjects, published in 2009 in "Nutrition and Cancer," researchers concluded that compounds in cacao might prevent cancer or improve the outcome when the disease is already present. However, they state that more extensive studies with larger populations are needed to confirm this. Growing grapes in Bali has started at the beginning of the 20th Century but it is only a few decades ago, after multiple trials and errors, survival to parasites and other vine diseases, that the grapes were grown with satisfaction on a commercial scale and found in markets all over the archipelago. The final choice was a black table grape variety of French origin called 'Alphonse Lavallée'. The vines in North Bali's vineyards are trained into an overhead trellis called Pergola, where the posts consist of small trees, which are regularly pruned. Besides keeping the workers cool, the pergola system reduces the risk of diseases and sunburn on the grapes, all contributing to a better fruit quality. The daily task of seeing the grapes protected from the elements is a full time operation and workers often live in houses built amongst the pergolas to take constant care in case of rain. The crops have a surprisingly high quality and the grapes brought to the winery are certainly ranked as the best of the best. 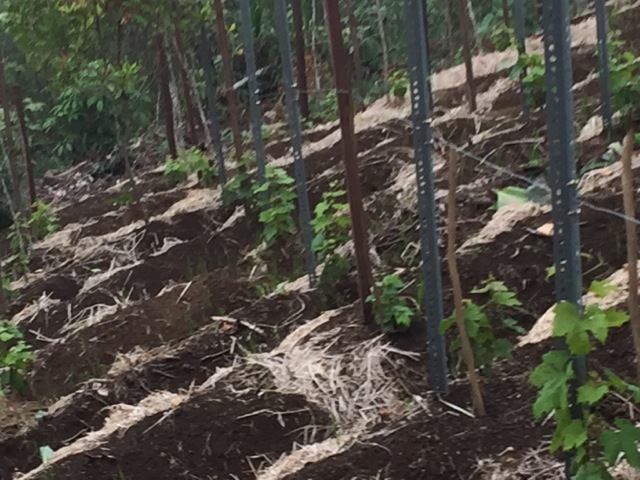 In our land in the hills of Bali, at Awan Damai, in Gunung Sari, we began to plant local Balinese grapes. about 500 pieces. The area is about 700 m in altitude and exposed to the North of the island. However, since we are only a few degrees below the equator, the sun comes straight overhead and thegrapes are exposed to the tropical sunshine. 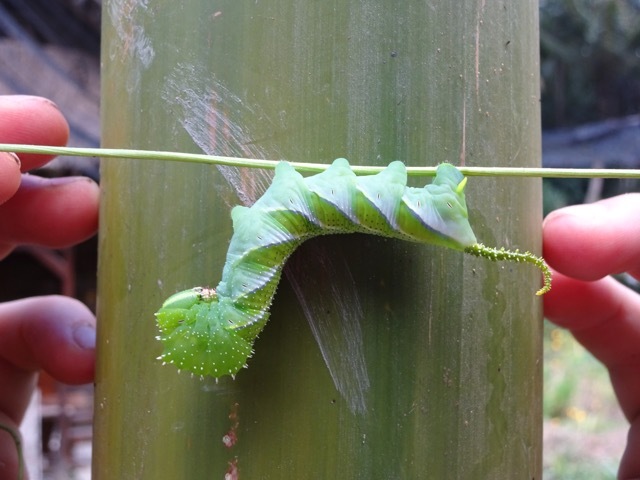 At the moment we are feeding some of the vines with EM, effective micro organisms and the others are being left without. We wish to see if the nutrients and bacteria in the EM does make a difference in growth. Our grapes are surrounded by miles and miles of clove trees which are harvested in September and dried. It is important to note that the tropical climate makes for the unique character of grapes of in Bali, grapes are constantly harvested from evergreen vines and wine can be produced all year long instead of once a year. While vines usually require a dormant period of cooler months, the vines in tropicalBali produce grapes continuously in 120-day cycles. The varieties grown in Bali are the local Propolinggo Biru, the French table grape Alphonse-Lavallée and the Belgia.